Today’s “Card of the Day” features a good Gold Paladin support! 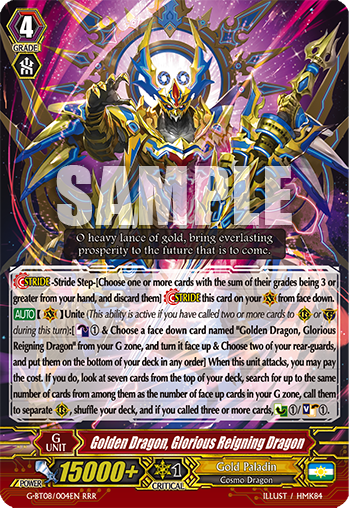 [AUTO](VC) Unite (This ability is active if you have called two or more cards to (RC) or (GC) during this turn):[Counter Blast (1) & Choose a face down card named “Golden Dragon, Glorious Reigning Dragon” from your G zone, and turn it face up & Choose two of your rear-guards, and put them on the bottom of your deck in any order] When this unit attacks, you may pay the cost. If you do, look at seven cards from the top of your deck, search for up to the same number of cards from among them as the number of face up cards in your G zone, call them to seperate (RC), shuffle your deck, and if you called three or more cards, Counter Charge (1)/Soul Charge (1).